Once inside, you definitely feel like you’ve wandered straight back to Colonial America. 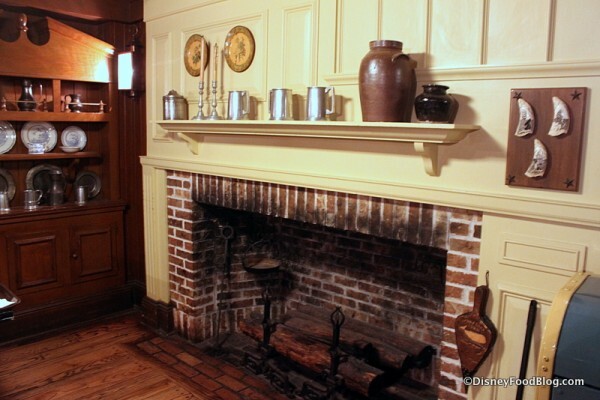 This fireplace and mantel are beautiful in their functional simplicity. And while logic tells me there’s never been a fire laid here, you’d never know it from the sooty bricks. 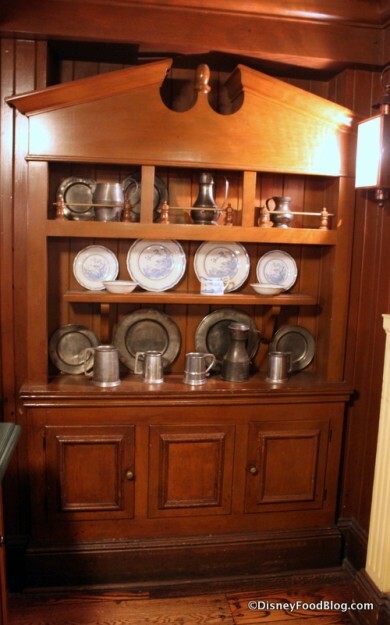 The oversized hutch houses a collection of authentic-looking pewter pitchers, tankards, and willowware. Within the main ordering area, pause for a moment to look up and observe the detail. 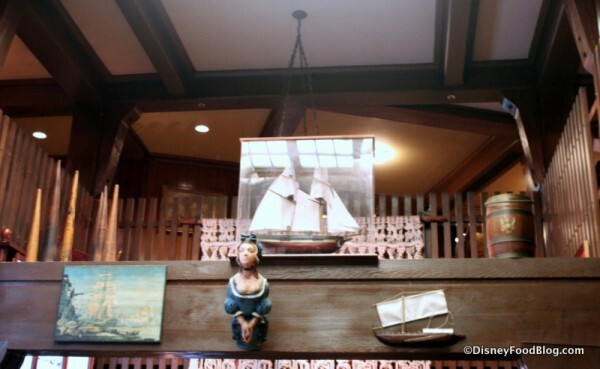 A full model of a ship is encased in glass (and is better observed from the second floor). But from below, it’s really fascinating to take in the ship figurehead, as well as an oil painting featuring the same type of seafaring subject. The ship wheel chandelier has ship lanterns mounted on four sides, and a framed edition of the First Navy Jack hangs nearby. 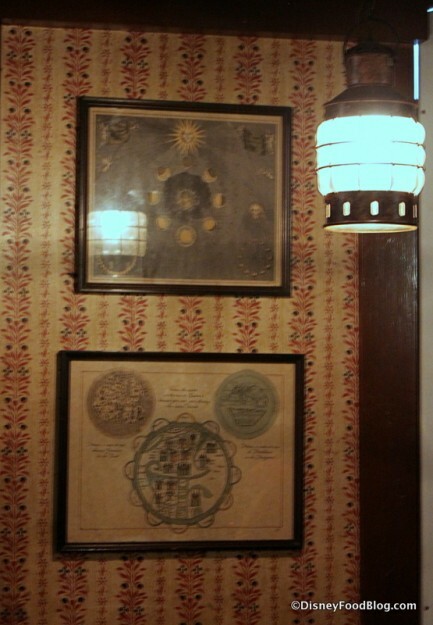 Interesting wall hangings depict the phases of the moon, and a globe map looks suspiciously like a Mouse we all know and love. Take a step back and you can see some of the atmosphere in context. The ordering area is actually an atrium, with a skylight allowing the sunshine to brighten the space naturally. The ordering area is classic Disney. 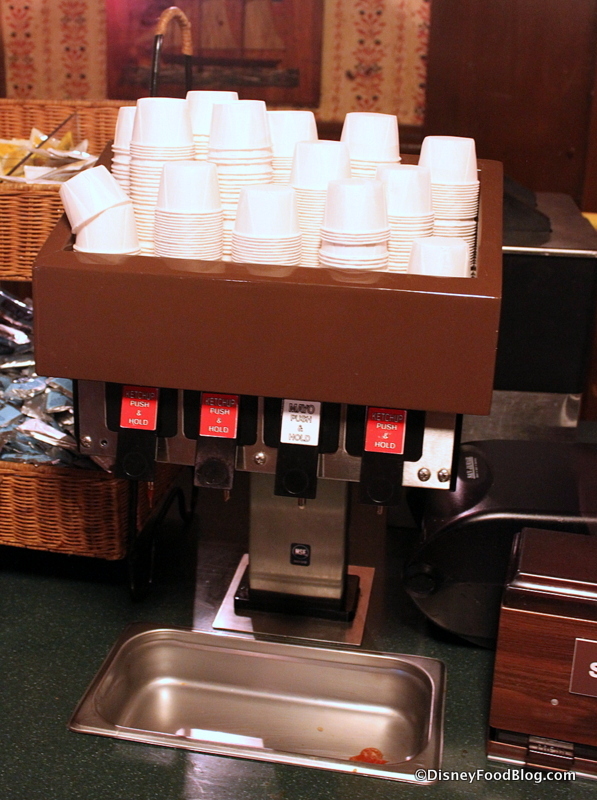 You won’t find self-serve kiosks here…yet. Normally, just because of the sheer enormity of the restaurant, you can find seats downstairs if you wander far enough. 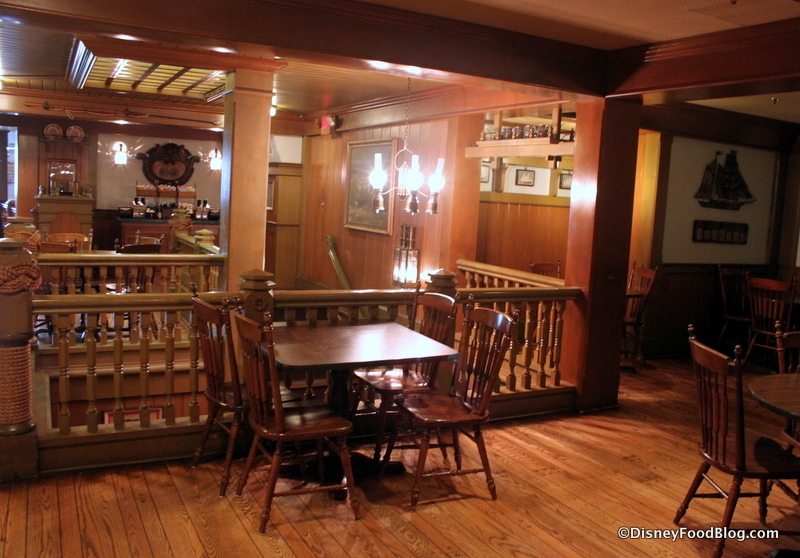 BUT — the real find at Columbia Harbour House is the upstairs seating area. It’s truly one of the best kept secrets at Disney World, because most people don’t even know it exists. 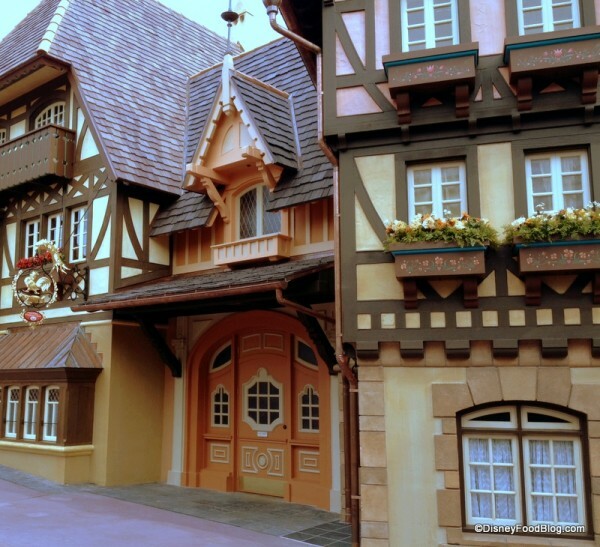 Kind of like the balcony seating at Pinocchio Village Haus in Fantasyland. Rich wood paneling surrounds the top of the stairs. Look back down over the railing, and you’ll see the ordering area. Ample wooden chairs surround wood-grained tables. I love the ceiling especially in this room, as the slight curve and wooden beaming feels like the inside cabin of a ship. And remember how busy it was downstairs? Ahhh…I love this. And round tables! 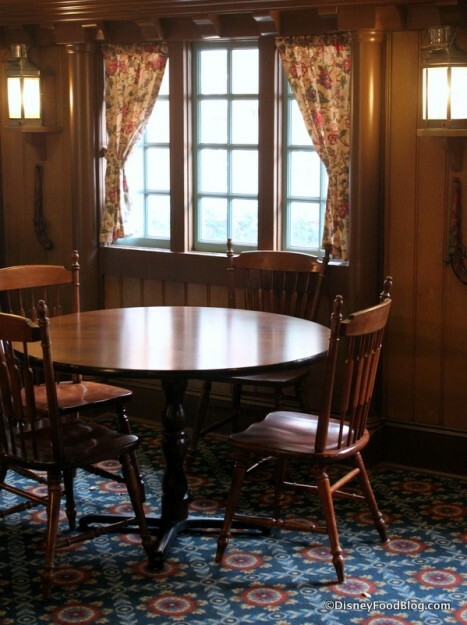 Windows from the second floor offer views of either Liberty Square or Fantasyland, depending which way you look. Now that I’ve shown you a little of just what you may be missing, let’s head back downstairs and order something. I’m starving! While the ordering area features the standard Disney cash registers and queues, menu boards are the updated LCD screens, which feature changing photos of the menu’s main items. 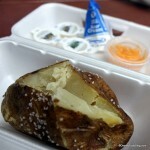 And if it’s light eating you’re after, check out the Grilled Salmon or Salad options. 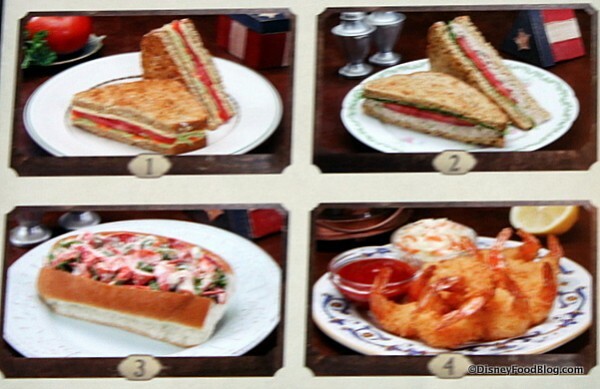 Photos of menu items make it easy to decide what you’d like to have. The spot has long featured one of Magic Kingdom’s most beloved and well-known vegetarian options, the Lighthouse Sandwich, which features Hummus, Tomatoes, and Broccoli Slaw. Folks love this winning combination! 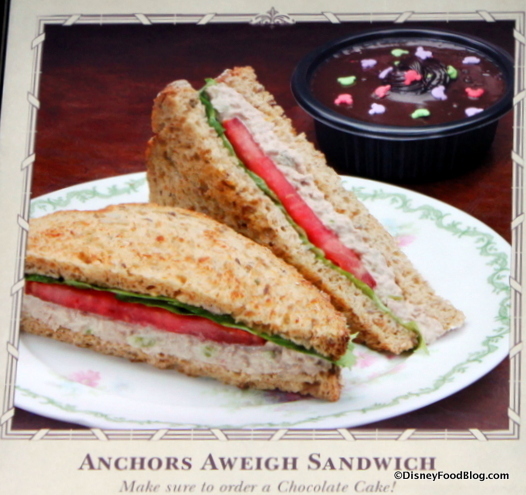 But there’s also another fan favorite here — the Anchors Aweigh Sandwich. 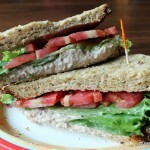 This Tuna Sandwich may not sound all that amazing, but it is! It’s routinely considered a guest favorite here. 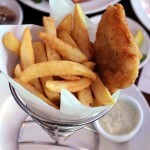 But this is also a great stop for some traditional fried options, especially if you like Fish and Chips. And Chicken Nuggets. Which I do. 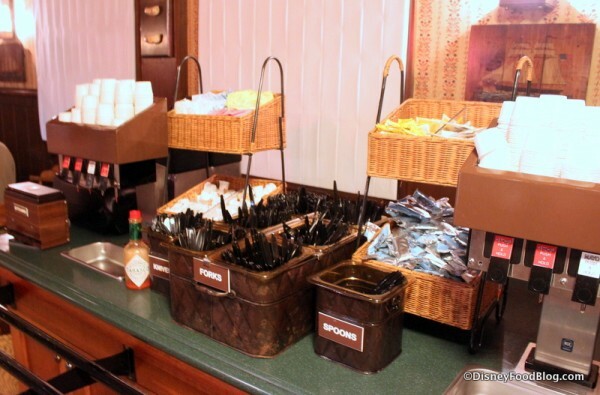 I made my selection and headed off to the condiment station to pick up some sauces, utensils, and napkins. The are LOTS of sauces and add-ons here…yay! Purists will be happy to find Malt Vinegar here. Ketchup and Mayo are also abundantly available, as is Tartar Sauce. 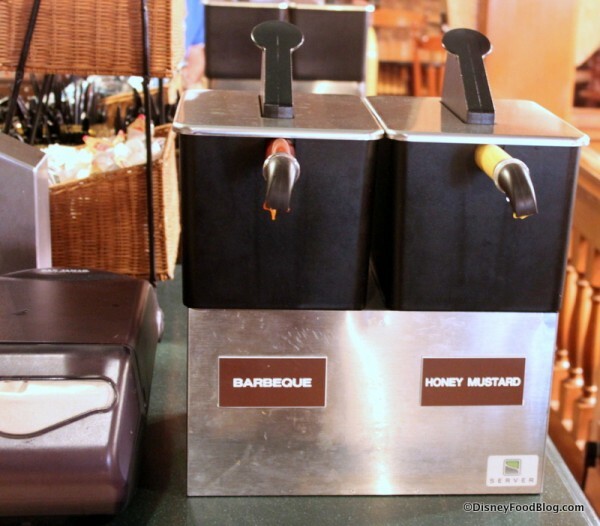 For your chicken dipping pleasure there’s both Barbecue and Honey Mustard “on tap”. As for my selection, I went with the Chicken Breast Nuggets and Fish. In an effort to provide guests with healthy options, the platter comes with your choice of Fries, Apple Slices, or Steamed Broccoli. 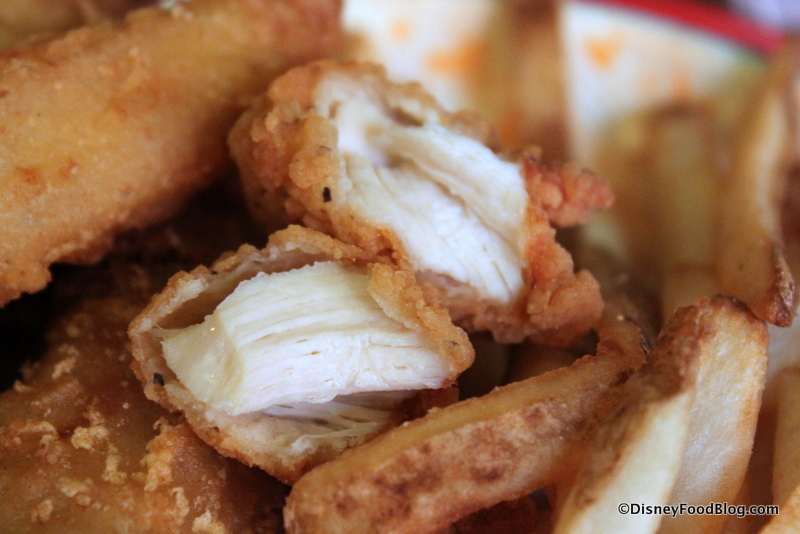 Fish and Chips and Disney’s chicken nuggets combined? Yes please. The breading is crisp and flavorful, and the meat is juicy. Even though the fries are technically a little skinny to be called chips, they were delicious as always! Beyond great taste, portions here are large. It would be VERY possible to share this meal, especially if you added a bowl of their creamy Clam Chowder. Read all about it in our DFB Guide to Magic Kingdom Snacks! 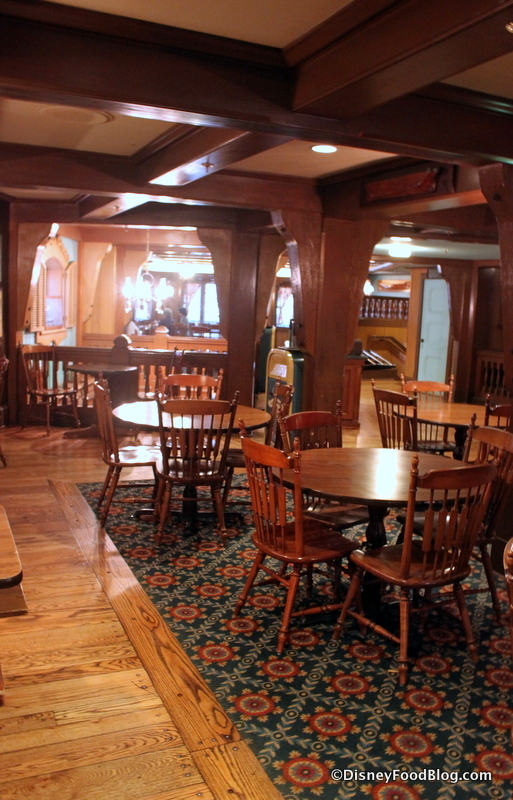 Columbia Harbour House has long been a Disney fan favorite, and it remains as such. It’s cozy, it’s a standing piece of Disney World history, and it’s big fun to wander around, taking in all the wall hangings and detail. 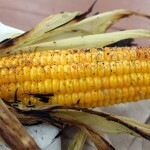 It’s a great option for hot, fast food when you don’t have an advance dining reservation. 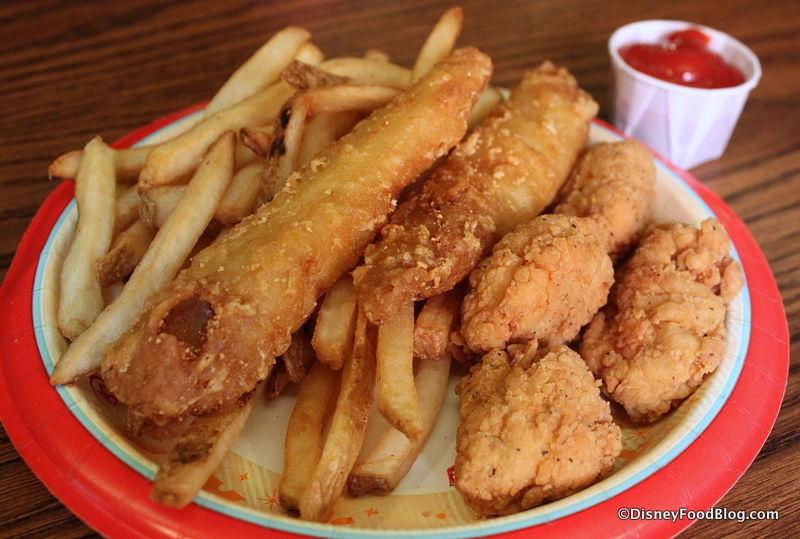 If you are looking for some delicious lighter fare, or you have a craving for fish and chips while at Magic Kingdom, be sure to give this spot a try. It’s a true hidden gem. Is Columbia Harbour House one of your favorites? Leave a comment and tell us about it! « News! Hollywood Brown Derby Patio Lounge May Be Opening Soon in Disney’s Hollywood Studios! I go to Disney all the time and I rarely eat here. But last time I visited I gave it a shot. I had the tuna sandwich and it really was good. I was a little worried to order it at first but I really wanted something light and not something fried or a burger. I would definitely eat here again. Next time I might try that fish and chicken nugget platter. Love Disney nuggets! I must admit, when I read this, I kind of felt that Disney do make a big effort at certain locations as they try to life their game inside the parks. I’m not a fish lover, but for some odd reason, Tuna is an exception, and like you say, the ‘Anchors Aweigh’ is way better than you’d imagine. We love the Hummus and the Tuna sandwiches! Plus, they come on whole grain breads — yum. This is my favorite quick service location! The lobster roll is sooooooo good! They really pack it full of lobster meat! we love CHH and eat here just about once a trip – the Lighthouse sandwich with chips is our favorite, even though we are not vegetarians! I was at Disney last week and ate here twice. The food is great and the frozen lemonade slush is even better. I had the chicken breast nuggets and fries, but other members of my family tried the fried fish, salmon and salad and we were all happy with our meals. The peach cobble was delicious for dessert. However, it was just as crowded upstairs as it was down, so I think the secret is out about dining upstairs. The lobster roll looks too mayonnaise-laden for my taste, but I love the chicken and fish and of course the sandwiches, these are some truly good sandwiches and I love the bread. Last time were were here, we were unusually disappointed. Something weird went on with the batter on the chicken and fish. But I’m sure it was a glitch and we’ll be back. Don’t tell people about the upstairs! We want to keep it empty! Seriously, nice job with this review. 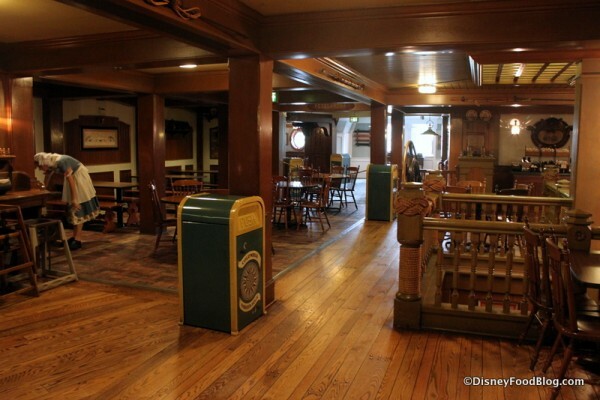 Columbia Harbour House is easily our place to eat in WDW. We eat there multiple times on most trips (every lunch at the Magic Kingdom). The food is solid, and it has the feeling of the Magic Kingdom from its early days (or at least the ’80s when I was a kid). It may be a bit crazy downstairs, but the upstairs is glorious and quiet. I ate here for the first time in 2011. My mom and I split the lobster roll and the broccoli peppercorn salad. They were both excellent and some of the best counter service food we ate the whole trip. You can only eat so many hamburgers in a week! I love CHH. 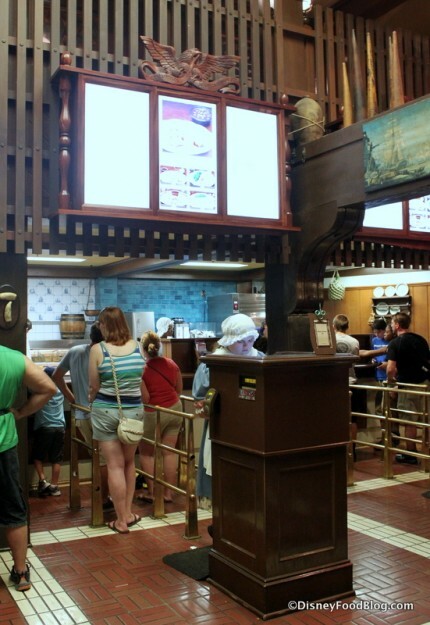 Columbia Harbour House is our second favorite MK counter service restaraunt. We always go there in the evening if we don’t have an ADR or if we’re spending two days at MK. I feel like I’m back home in New England there. Yes, the upstairs is awesome! The restaurant was packed last time we were there, but the upstairs was practically empty, and we had no problem finding a table for our large group. There are restrooms up there too. I got the lobster roll when I was there, and I have to say I was not impressed. There was lobster on it, but there was also a lot of mayonnaise and bell pepper. Honestly, the only flavor I really got was the pepper, which happens to be something I’m not particularly fond of and was not expecting at the time. I don’t know, maybe it was an off day. The fried shrimp the rest of my family got though was delicious! One of our favorite places to eat at WDW! We love those sandwiches, which are an especially nice choice if paying OOP. I have also tried the clam chowder (good), the shrimp platter (really good), and the fried fish (even better now that you can get a non-fried option for your side). Sadly, my husband and I can no longer climb the stairs, but if you can, sitting upstairs can be a peaceful pleasure. We love CHH! It’s often our first meal at MK. I almost always get the salmon with couscous and broccoli. It is consistently delicious! The tuna sandwich was awesome on my last visit. I want to try the lobster roll next time. 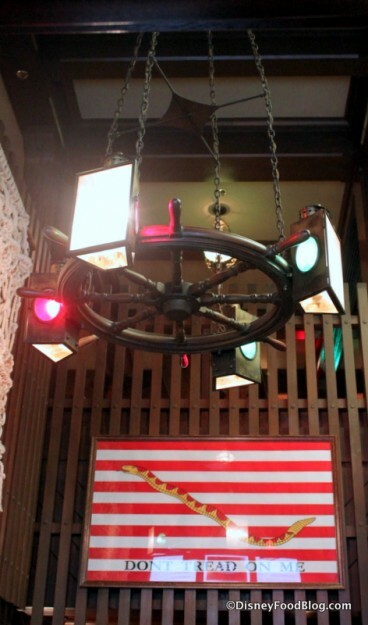 Thanks for pointing out a lot of decor that we had never noticed! This was one of our family’s favorite many years ago when it was consistently uncrowded. Then four years ago, my husband and I were there at a slow, low crowd level time of year. As Katie experienced, we found the upstairs totally full. And very messy. We’ve now taken it off our list. Still, the offerings are and were good. 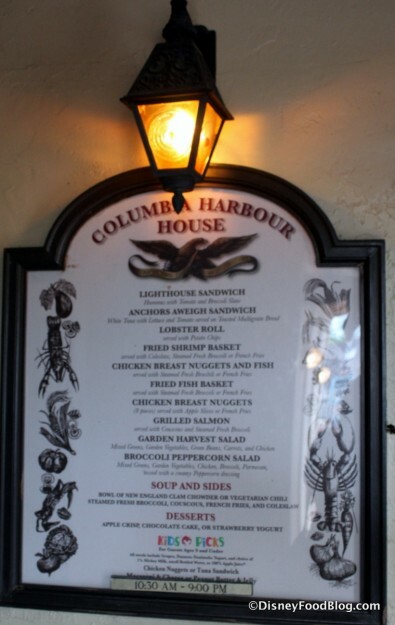 We love Columbia Harbor House! The food is great and the upstairs dining room is a welcome break from the crowds. A visit isn’t complete with the seasonal cobbler – it’s always delicious!! Over the last couple of years, Columbia Harbour House has become one of the restaurants that I really like to eat at when I’m at WDW. The food is great and the seating is plentiful (and I agree about sitting upstairs). 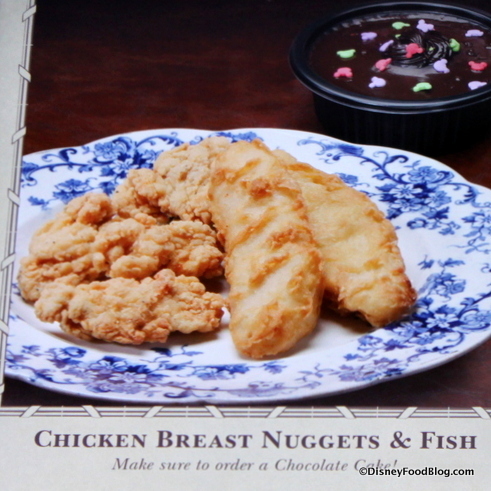 I too am a fan of the fish and chicken nugget platter. Very tasty. We always order the garden harvest salad and the fried shrimp. It’s almost a tradition o have lunch a CHH on our first MK day and order that. Next time we’re doing CHH twice so we an also order the lobster roll and the humus sandwich. So delicious! Unfortunately the clam chowder appears almost as a afterthought on the menu. That is a shame as if you taste it, its clear a chef somewhere didn’t treat it as an afterthought when they made it! You left out the vegetarian chili! This is actually one of the cheapest yet most delicious things you can find in the MK, especially if you are trying to not have fried (which is delicious but still…). We are planning on having our dinner here when we are there in May. BUT only if they have cocktail sauce. Does anyone know if they do? I love the Columbia Harbour House! It is a tradition for one of my best friends and I to always stop there when we get together at Disney. The fish and chips are really good and the portions are more than filling. I love that it is near the Haunted Mansion. CHH is Delicious!! I went there twice while at MK. First time I tried the Tuna Sandwich, and customized to substitute fries for the chips. Normally I am really apprehensive to order tuna anywhere (it’s the kind of food that’s usually better made at home). However, the sandwich was really quite good! The bread was delicious, it had really fresh, ripe tomatoes and lettuce, and the tuna had some really good flavors going on. It reminded me of a BLT (minus the B). 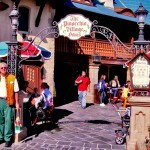 It’s a really nice–dare I say refreshing–option to all of the other park fare; i.e., fried food and burgers. Second time I went for the Salmon dinner, as I heard it was really good, but they were all out, so I settled on Fish & Chips. Also delish! The fries had great flavor, and the fish was made really well. Lots of moist fish underneath a crispy batter–it’s surprisingly done right. And they have malt vinegar packets. My bf tried the Lobster Roll; it had too much mayo for our tastes. It’s a must visit place for me! I absolutely have to have the hummus sandwich every trip. The best quick service in Disney!!! Awww! AJ, you gave away one of my family’s long-held secret spots! 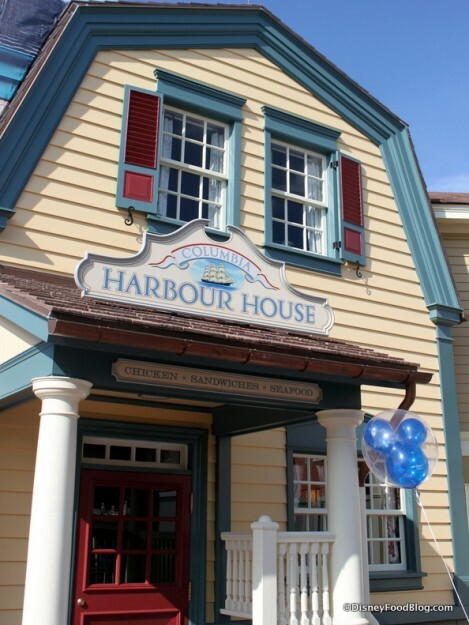 Harbour House is usually our counter-service of choice at MK. We usually get a couple of entrees and share. I love their NE Clam Chowder. Tuna is a fav or ours as is the fried shrimp platter. 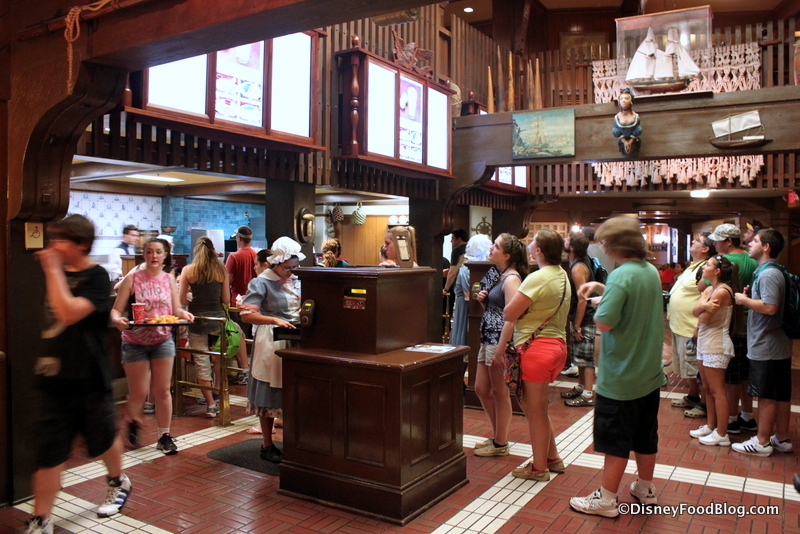 CHH is the best counter service restaurant at Magic Kingdom. My family enjoyed this place so much we ate lunch there several times during our one week stay. We could not find anything on the menu that we did not like. I cannot recommend this place enough. We’re actually in Disney World right now! This is ALWAYS a must die us. had the Chicken & Fish. They loved it too. Kara, there is stroller parking right outside, to the Liberty Square side. I’ve only taken my stroller inside at restaurants if the kid in it is asleep. Has anyone else noticed an elevator? The upstairs restroom is definitely not ADA compliant. I missed this great blog yesterday! CHH is my favorite QS eatery in the MK, although it now shares that honor with lunch at BOG in the New Fantasyland. I’ve loved the CHH since I first ate there and no trip is complete without a visit here. I don’t think that there is anything on the menu that I don’t like and I love to look out the window and see my favorite Haunted Mansion as I eat my meal. It’s just a wonderful place to eat all year around. I love the Garden Harvest Salad, they give you alot of chicken in it & the flavors taste good together. The mixed greens are always fresh. When you book the 4 hour tour you pre-order lunch here & it is waiting for you at tables upstairs in a reserved area. Yes there is a small elevator in the kitchen but probably only reserved for those with disabilities on the tour, besides the wait staff. One of my family members is confined to a scooter & is on oxygen so they took us up on the elevator. We have loved CHH ever since we discovered it during our keys to the kingdom tour in 2004. Love the tuna sandwhich and the new salads are fantastic! But, please stop telling everyone about the upstairs seating, lol. We are wanting to try this place out. I am not a huge seafood lover reason why we always skip this place. My husband is curious how many shrimp you get on the fried shrimp plate? I told him it appears 8 or more. He said I’m sure they only give you 4-6. Anyone know??? Please and thank you!!! Jay, Ate there last Saturday and had the shrimp and I think it was 6 but they are big and you leave feeling very full. In fact we loved it so much we went back twice more. We ate the lobster, tuna and salmon oh and the clam chowder which was huge and delicious. Loved it and will definitely eat there again. I had the broccoli with the shrimp and salmon and I was really surprised at the quality of it. Obviously fresh and cooked perfectly. Just wonderful and delicious. Two years ago we ate here basically because no one could make up their minds and someone, somewhere had said it was good. It was GREAT, loved the atmosphere, loved the shrimp platter. Every year before our visit the wife plans out our meal locations. Last year we ate there twice. Hadn’t been in here for years, but a stopped in yesterday when we saw the lobster roll on the menu while walking by. We loved it and found it to be pretty good value when compared to the small one you get at the Food and Wine Festival. Had a very nice table with a view upstairs. A very pleasant lunch. 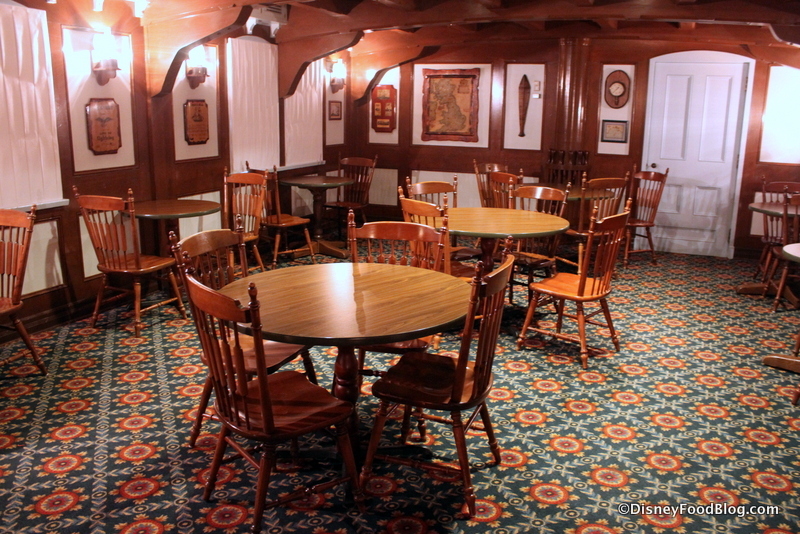 We ate here twice during our stay last year, and the quiet upstairs seating is a godsend! I’m vegetarian, but both times I had the Garden Harvest Salad and asked for it to be made without the chicken, which they did with no problems. All of the veggies were so fresh and flavourful which made it so tasty. We’re from the UK so maybe that’s what all vegetables taste like in Florida, but it was delicious all the same! My family eats here on our 1st day for lunch every year! It’s a tradition….we love this place. We love this place, often eating here twice in one day, especially in cooler months. My husband adores the clam chowder and its honestly his favorite version in or out of the parks. Did not know about the upper room though, we will have to check that out. Never noticed this place before, but looks like my new favorite restaurant. Thank you! We ate here on our recent trip to Disney. My children found it interesting to look up at the ships figurehead also…. Specifically they pointed out the strategic placement of her hands. O.o that was a bit of a shock. We found the Columbia Harbour House on this trip to WDW. Oh my goodness it was so good. We had the fish and chicken and it was the best I’ve ever had. This is now our go to spot when we visit the magic Kingdom. Lobster Roll is packed. However the mayo is excessive!!! Need to cut it down to make it perfect. We ate here for the first time on our last trip and loved it. We usually eat at Peco Bill’s when we visit MK, so this was a nice change of pace. The portions were huge and the food was very good. The atmosphere is really cute, too.